Home / android / oppo / smartphone / specs / OPPO R17 Pro released in the Philippines. | See Price and Specification. OPPO R17 Pro released in the Philippines. | See Price and Specification. 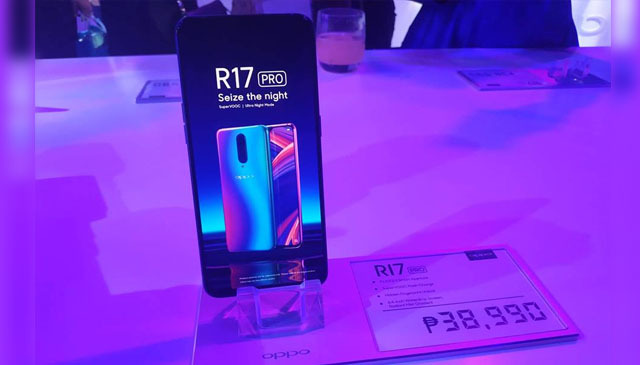 OPPO officially announced the R17 Pro in the Philippines. OPPO with the big leap as they unveils the first R Series device that is officially out and available in the country this holiday season. In the recent years, OPPO focus in the budget to mid-range smartphones that is packed with stunning selfie camera's in the Philippine market but this year they added a high-end phone which is the OPPO Find X and the new higher-mid tier smartphone, the OPPO R17 Pro. The OPPO R17 Pro main features is its triple rear camera that can capture stunning photo even in the night with its f/1.5 - f/2.4 aperture on the main camera and on the second cam. Under display fingerprint sensor is one of the newest technology smartphone has today, with this technology the fingerprint sensor doesn't need to block the beauty of the device and the OPPO R17 Pro becomes more premium, together with the 6.4-inch WaterDrop display notch protected by Corning Gorilla Glass 6. Another cool feature is the SuperVOOC flash charging which gives you a 40% charge of battery in 10 minutes of charging and achieve a fully charge R17 Pro in just 35 minutes. The OPPO R17 Pro is price at PHP 38,990 and will be available for pre-order starting November 8 until November 21. For every successful pre-order comes with FREE OLike bluetooth speaker worth PHP 2,500.